bl.uk > Online Gallery Home	> Online exhibitions	> Asia, Pacific and Africa Collections	> View of Maugree pagodas. 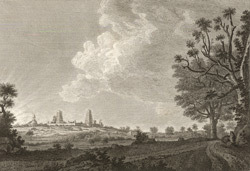 Etching with line-engraving of a view of Maugree pagodas by James Fittler (1758-1835) after sketches Robert Home (1752-1834) had made when he had accompanied the troops in Lord Cornwallis's campaign against Tipu Sultan in 1792. Plate 12 from Robert Home's 'Select Views in Mysore, the country of Tippoo Sultan' published in London in 1794. Maugree is situated north west of Savandrug. Robert Home thought that the numerous pagodas, or Hindu temples were: 'Lofty and of elegant structure, they are built on an eminence, commanding a fine prospect of the country around...In them are depicted under a variety of allegorical forms the hindu deities; particularly the god Vishnu'.